Got your eye on Amish furniture in Iowa? The Hawkeye State has been home to Amish for over 150 years. Amish woodworking shops are found across Iowa’s 20 Amish communities. Like their counterparts in other states, Iowa Amish produce a wide range of furniture for the bedroom, office, dining room, kitchen, and elsewhere in the home. From Des Moines to Cedar Rapids, from Dubuque to Davenport to Iowa City, Amish furniture is within easy reach of Iowa natives. Retailer carrying outdoor Amish furniture. Davenport area dealer for the Simply Amish network of Amish furniture manufacturers. Outdoor and lawn furniture made by Amish and Mennonite craftsmen. Wooden and vinyl gazebos, poly furniture, gliders, swings, wooden chairs, benches, picnic tables, playhouses, sheds, lighthouses, pergolas, and more. Amish-made furniture produced by Amish in Indiana. Amish-made gliders, rockers, recliners, entertainment systems, bookshelves, desks, cabinets, office furniture, occasional tables, hutches, buffets, dining room and living room furniture, and more. Nine thousand square foot showroom offering Amish furniture built in Indiana. Dining room sets, bedroom sets, chairs, sofas, home accessories. Amish Furniture Factory sells furniture and accessories for all areas of the home. The best-selling furniture items are for the dining room, bedroom, and entertainment area. Furniture is built by skilled craftsman in Northern Indiana. Competitive prices, attentive service, and quality and beauty of furniture are points of pride for Amish Furniture Factory. Amish Fine Furnishings is a family owned, service oriented business crafted to providing a unique experience designed to help you select your new furniture in your new home. Scan our website, gather some ideas, pick your room, your furniture styles, and let us provide you with the information you will need to make an invested decision. Our furniture selection doesn’t end with one room in mind, it flows thru the house from the kitchen table to the mudroom, including the bedroom, office, to find your self relaxing in the living room in a Amish glider. Give us a call, send us an email and let us do the work for you. Thank you from our family to yours for allowing us the privilege to handle your furniture needs. Looking for Amish furniture dealers in neighboring states? Visit the Amish Furniture Guide main listings page for a full directory. Note to Iowa residents: Please be sure to check opening hours of any Amish furniture businesses listed in this guide before traveling long distances to visit them. While we strive to keep this directory up-to-date, business locations and availability can change. Not responsible for changes to information. Amish have found a home in Iowa since the first settlers arrived in the Kalona area of southeast Iowa in the 1840s. Amish furniture in Iowa is a relatively more recent phenomenon. Amish have long found a happy home on the farm, with dairies and cash crops providing a living for Amish families for generations. In recent decades an entrepreneurial trend has swept Amish society. Ever-large families and high land prices in their traditional areas have driven Amish to open a wide range of small businesses, including dry goods and crafts stores, salvage groceries, metal and machine shops, engine repair, and numerous others. The wood industry has proven most popular for Amish, however, with a wide range of wood-related businesses emerging, furniture-making chief among them. Amish have proven adept at crafting a diverse range of home furnishings. Amish furniture is not just plain and simple, running the gamut from the traditional styles such as Mission, Shaker, Queen Anne and others, to contemporary styles at home in an urban loft or suburban household. Amish have developed a deserved reputation for quality craftsmanship. Perusing the literature potential buyers will also notice an emphasis on hardwood construction over particle board, veneer and pressed wood. Oak, quarter-sawn oak, maple, cherry, and walnut are commonly-used woods in Amish furniture workshops. Amish furniture craftsmen are remarkably versatile, stepping outside of their plain sensibilities to customize furniture to client’s needs. Custom furniture craftsmanship is frequently seen among Amish, in addition to standard furniture lines. Amish entrepreneurs show a high responsiveness to trends, as well as exhibiting a creative side in innovating new designs and styles. Iowa’s largest Amish settlements are found in three locations: 1) Kalona, in Washington and Johnson Counties in SE Iowa; 2) Bloomfield, in David County, also in the southeast, and 3) Buchanan County, in northeastern Iowa (Read more on Iowa Amish). Amish furniture seekers, looking for Amish furniture direct from the source, are probably better served in the first 2 of these communities, which are more progressive relative to the highly conservative Buchanan County Amish. 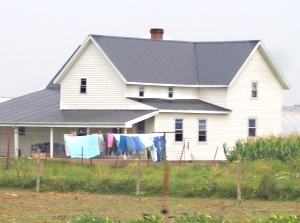 Higher levels of technology generally permit Amish more versatility and scale in furniture production; however more conservative Amish communities also produce furniture, though often on a smaller scale. Like Amish in most other states, Iowa’s Amish population continues to grow. New generations of Amish follow in parents’ footsteps in opening wood working shops. Iowa Amish furniture seekers have a number of options, from finding Amish furniture direct at the source, or by purchasing it from a range of dealers across the Hawkeye State, or visiting an online Amish furniture dealer from the comfort of home. We have 2 big oak tree in our back yard and we want to get rid off them. Wondering if there are any company will buy them? I live in Iowa. Can someone please give me some information? Thanks a lot! Marlen, I am not sure about Amish cabin makers in your area but maybe someone who sees this could pass along the request. There are Amish who do that kind of work but I am just not aware of who exactly does it in Iowa. I hope to have those kinds of listings available at some point in future. Adam same for your tree removal request. I hope you’ve been able to find someone in the meantime. There are loggers and wood dealers among the Amish as well. Where are you located in IA? There is an Amish gentlemen in Osakis, MN that makes beautiful log cabins. I can give you his address and a phone number. His english neighbor delivers messages to him. We just boughjt an antique pie safe made by LC Wilson of Iowa. Does anybody have any information about this manufacturer or furniture. Michael going by the name it doesn’t sound like it’s of Amish origin. Also the Amish furniture industry is a relatively recent phenomenon so the number of antiques in circulation made by a bona fide Amish company would be low. Thank you, Erik, for your time and knowledge. We love our newly purchased antique (circa 1865) and were reaching out to try to find out some of its history. I hope the new year is a happy one for you and your family. Hello, I am looking for a direct source for hand made furniture. I love the quality and the lasting power of handcrafted furniture. Is there towns I can go to, to meet someone? Do the makers finance any purchases or is it pay up front? Kyle in Iowa there are definitely Amish woodworkers in the two large communities at Kalona (Washington/Johnson County), and Bloomfield (Davis County, both are in Southeast Iowa). I don’t know how many retail vs. wholesale but it’s quite possible that some do. These are both communities of around 1000+ Amish population. On finance you’ll probably find there are different ways to do it depending on the seller. Hello, I have a solid cherry, drop leaf table, 4 chairs and china cabinet in a Queen Anne style, that my grandmother purchased in 1958. My mother told me it was made at Amana Colonies. How can I find it’s value, is there a good market for it, and how would I go about selling to someone who appreciates what they are? We have a large cabinet and counter (circa 1917)hand made out of yellow pine. We have to remove it as we are re doing our kitchen. We would gldly give it to anyone who would like to salvage the lumber (drawers, doors, counter-top) Lumber like this is nearly impossible to find and I hate to destroy it. I am looking to purchase bedroom furniture, a dining table set and misc living room furniture direct from the builder.I live in central Minnesota so the Long Prarie area or Harmony Amish communities would be my best bet without driving to far from home.Figure I can purchase twice as much furniture for the dollar by eliminating the middle man ( retailer ) If any of ya”ll have any information for me it will be greatly appreciated! Why dont you check country spice decor they are an amish furniture store and they can ship out everything directly to you let me give you their website www.countryspicedecor.com phone is 260 768 7245 just let them know Rose Pruitt reffered you and you could even get a discount! Rose and Erin, Thank you for your replies!! You’re welcome! Hope you can find what you’re looking for! I purchased a 4 foot poly glider (Adirondack) in black and cherry in 2009. The seat middle support broke at the bolt that connects to the back middle support. Where can I get a replacement part for the support that broke. Thanks for the help. in need of a cleaner hickory kitchen. Dont want to skimp.plywood construction, soft close drawer guides, etc…. my current woodworker just closed his doors, and i need my kitchen cabinets in a month or less. I’m in central iowa. Your website needs to be updated. Your website needs to be updated. Kalona Furniture no longer exists. JK Creative Wood is now the closest place to Kalona to buy Amish furniture. We feature dining furniture and custom designed bedroom furniture. Our Amish furniture is authentically Amish, not factory built. Mary, this reminds me of Yoder’s Indian Creek Furniture of Milton, Iowa, unless you had something in mind in Bloomfield, Iowa. We did not grow a garden this year and are new to the area. I would like to know where do I go to get Produce for canning? I live in Butler county, Iowa. Thank you with any information. I would love to see thee tools go to someone that could use them.